Make sure you read the lead-in 1st. None of the information in the lead-in was meant to be an excuse. Yeah the final 13 days before the race didn’t go quite as expected, and 10 days off from running was not ideal, but I don’t think any of that really played into my race day blues. I had a great first 22 miles. But I’m getting ahead of myself. I think I’ll just do a quick re-cap and then list out some thoughts. Writing a race report for the same race four years in a row gets a little old. You can see the elevation profile and some shots of the trail in past years’ reports (2010, 2011, 2012). After the 10 minute ride to the start, as we were getting off the bus, the race director was yelled “5 minutes to go! Hurry Hurry!” I still had a lot of extra clothes on (it was 19F!) and I thought I’d hit the port-a-pot one last time, and I had just enough time to get all my gear right and drop my drop-bag in the big pile of bags and run to the start. Just in time to hear the 2 minute pre-race briefing and we were off. Right out of the gate and up the 1st big hill, I was in the top 10 runners, which was not wise. In fact, I was just behind Brandon, who I knew was going for a sub 7:00, so it was a little silly for me to be up there. The lead 5 or 6 went off the wrong way, and before I could say anything Brandon was yelling and corralling them back in. I’d like to note that this is the same “split” that I missed in my training run three weeks ago — when it was dark and foggy. But really, if you’ve never run this race, it would not be obvious at all to turn. I thought in past years there was a rope, but maybe not. Turns out the 20 milers an hour later and 8 milers two hours later all did the same thing. Well, it took a couple miles for me to back off, but I finally did, and felt pretty good. I walked all the really steep hills and ran everything else. I never felt like I was pushing too hard, though in hindsight I probably was. I was looking at my pacing and comparing it to last year, when I broke 8:00 hours, which to me was always only possible on a near perfect day. Could I possibly replicate that again? To cut a long story short, I ran the first 22 miles pretty well, often trading places with Ernest whom I had met and run with last year. I hit the turn at 20 miles in 3:45, pretty much the exact same time as last year. I was in and out in 1-2 minutes, and I felt even better coming out of the turn than going in. For about two miles. It was then that I felt like I was fading, and fading fast. I let Ernest pass and said “have a great race!” because I knew then I was going to suffer. There’s not much to say about the last 18 miles… It was a struggle. I walked just as much as I ran. Nothing major was wrong, just lots of little things. Left knee was bugging me, breathing was not great, nutrition was not bad but nothing really hit the spot and gave me the big burst of energy that I so needed. One thing that did help is that when I reached mile 32, I saw Jason there. He had taken kid duty of his own two and our two while Kelly and Lauren ran the 8, but had opted to hang out there and run in with me. I felt terrible as I was more than an hour behind when I would have been had I been able to duplicate the sub 8:00. But it was nice to have someone with me, and now I know what it would feel like to have a pacer, if I ever have one. Anyone reading this that wants to pace me at Leadville this year, please let me know. 🙂 I did tell Jason to run off a few times — he was fresh and itching to get in a work out, and I didn’t want him to get too cold “running” at my pace. Shoes: I went with the Merrell Mix Master 2, and this is the 2nd time I’ve gotten lateral knee pain in my left knee on a long run in them. 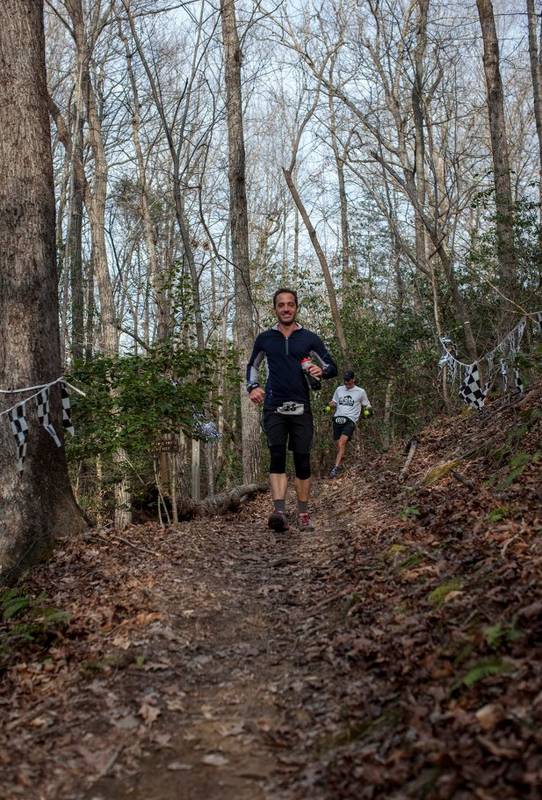 The 1st time was the Art Loeb – Run Gone Bad training run, in which we sort-a kind-a lost the trail and had to head back to the start, 10 miles downhill on pavement. I had put off the MM2 issues to the downhill pavement section, but maybe not. Overall I like the shoe a lot, at least in shorter runs, but it might be time to look for an ultra-distance shoe that doesn’t cause any issues. I’m thinking about the Altra Superior. Breathing: After the debacle that was Ridge 2 Bridge this year, in which my breathing fell apart in mile 1 and only got worse, I have taken to albuterol again a few times. Prior to that run it had been 4+ years since I’ve needed anything, but since then, I’ve gone into wheezing shallow breathing mode a couple of times. So I tried albuterol and it does seem to help. For Uhwarrie I took the prescribed two puffs about 6:15 a.m. and threw the puffer in my drop-bag. I am still regretting that I opted not to take another puff there! I saw the inhaler and briefly thought about it, but my breathing had been fine on the 1st 20 and I thought I’d be ok. But around mile 22+ when I started to fade, I had trouble breathing deeply. No wheezing or tight constriction like R2B, but I was not able to get the amount of air I wanted. Nutrition: I had experimented with plain Ucan super starch flavored with Nuun on a 5 hour training run in Uhwarrie a few weeks prior to the race, and stuck with that. I had used less than 500 calories on that run with no problems. For the race, my 1st bottle was flavored with Heed, and my turnaround bottle had Nuun it. To that I added some BCAA’s (MAP) in pill form, but I don’t really know if they made a difference or not. I think I took one gel around 2 hours in and another maybe 5 hours in, as I felt like I needed a bit more. I ate a few of the peeled boiled potatoes and a few potato chips. And a few nibbles of cookie. But nothing felt great, and nothing gave me the spark I was looking for. I never had Gi distress, I just didn’t feel super energized. Oh, and I had my 1st sips of soda in maybe 5 years… At mile 26 I had 3 sips of coke, but it was not flat, and that was all I could handle. Then I had one or two more sips of coke and a few sips of mountain dew at the subsequent aid stations. Again, I was just looking for something, anything, that would give me a spark, but nothing did. I’d guess I was in the sub 1000 calorie range for nearly 9 hours, but I don’t think the low calories was the heart of the issue. I might need more experimentation with ucan to figure out how to use it to its fullest. Jet lag. Tough plane ride. Could have been anything. The body is a complex system. Still, pretty darn good Uwharrie if I say so. See you at Umstead!